The Portuguese administration of Mozambique lasted for more then four centuries, from the 16th century till late 20th century. 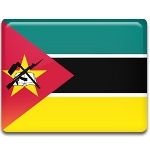 September 7 is known in Mozambique as Victory Day, that is observed to celebrate the signing of the Lusaka Accord officially ending the Mozambican War of Independence. The Mozambican War of Independence started in 1964, when the anti-colonial and communist ideologies spread across Africa. The campaign against Portugal was initiated by the Front for the Liberation of Mozambique (FRELIMO). The war ended after ten years, when the Estado Novo regime was replaced in Portugal. The end of the warfare was marked by signing of the Lusaka Accord in the city of Lusaka (Zambia) on September 7, 1974. According to the Accord, Portugal would grant Mozambique independence in 1975. Victory Day is one of the major national holidays. Every year President of Mozambique and the political leaders lay wreaths at the monument of the people's heroes to mark the victory in the war. President of Mozambique delivers a solemn speech, calling to the Mozambicans to rebuild their nation.